Dad was a big bathroom guy. You know, with the outdoorsy magazines, the seed catalogs, paperback Westerns—all stacked beside the toilet. The “smallest room in the house” was multifunctional—reading nook, meditation space, and day-planning war room. Dad once told me a story about his days as a greenhorn architect. After designing a bowling alley (which just paid for baby brother’s post-maternity hospital bill), Dad was sent to the Lone Star State to work on some oil tycoon’s project. I veer into the scatological not to demean the memory of my father, but to evoke the physical presence of the man. 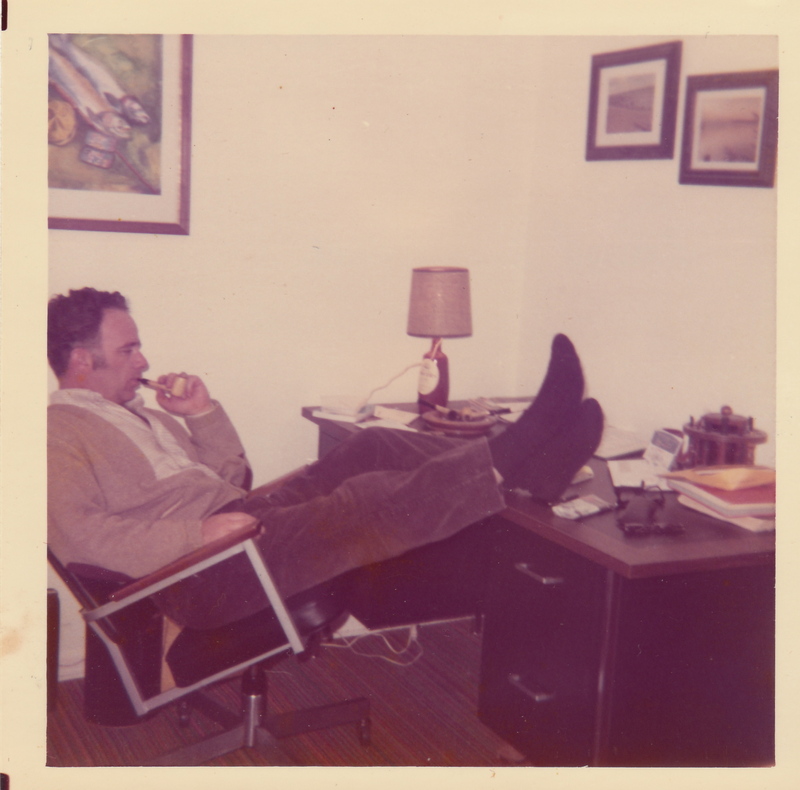 He loved his mornings: his pipe with Borkum Riff Amphora Blend, a cup of strong black coffee, the radio spilling out hog reports and top-of-the-hour news from WCCO-AM, the morning Minneapolis Tribune, and his University project plans that got neatly tucked into his briefcase. The bathroom attached to his den worked in synchronicity with his work desk—after coming to grips with the day ahead, it was time to hit the “thunder mug,” shower, shave, and slap on some Old Spice. That’s how I remember him from that time: bitter black coffee, pipe tobacco, and stinky cologne. He always kept a wall calendar loaded with appointments—then he’d X-off the day when it was done. He came straight home from work, pulled himself away from the dinner table, and took off in the boat, not returning until well after sunset. My brother and I would sit at the top of the stairs, watching as the white stern light and red and green bow lights sliced through the dark water toward our dock. Brian would run down to bring in the line and tether the boat. “What’d ya catch, Dad?” he’d shout. 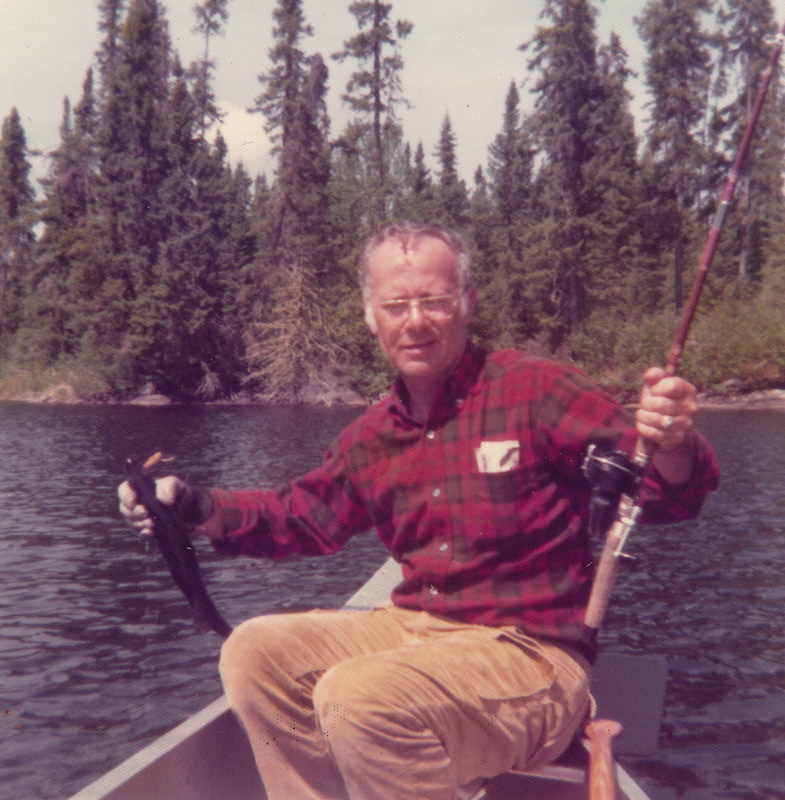 After Dad passed away, Brian inherited all his fishing gear, and I’m glad for that. It just made sense. Dad bought me all the Yale Shakespeare I currently own. He knew I loved books more than fishing. I’ve often thought about that afternoon he died. He was sitting in his favorite chair in his Florida den, the connecting creek to the Intracoastal Waterway not more than 100 yards away. I’m certain he had his morning routine, read in the bathroom, prayed about how much he missed Mom, and then went to church, as it was a Sunday. He lunched with the pastor and a visitor from out of town, and then probably came home to nap, waking in time to call his sister Joyce in Indiana. His next call would’ve been probably to Brian or me. We always talked on Sunday afternoons, even before Mom died. At around 2:15 p.m. on Sept. 7, 2008, he passed away in that chair. When Brian and I entered the house, upon arriving from Tampa a day or two later, we found their Cocker Spaniel, Sidney, cowering in his dog bed in the kitchen, the living room TV blaring (a neighbor had turned it on to keep the dog company), and everything in Dad’s den left just as it was the moment the EMTs pulled his body from the chair. On the credenza, clipped to a wall calendar, were two photos: one of me at seven, the other of my girlfriend and I attending a fundraiser from earlier that summer of 2008. On the calendar he had X’ed out the days as he always did … except for one thing. Two or three days before that Sunday, he started making the X’s into crosses—clear, definitive symbols of Christ’s crucifixion. I do not know why he did that. And it still baffles me. ~ by completelyinthedark on August 6, 2011. Belated Father’s Day gift to all my “father friends” out there. New multi-part post next Friday!